The Perks of Studying and Living in Leiden (1/2) – Look at These Lovely Animals! I used to be a 100% “urban” girl back home in China, living in various types of concrete forests. Even when I came here to the Netherlands and got enrolled in Leiden University, I ended up living and studying in The Hague (some of Leiden’s Bachelor’s programmes are located in Campus The Hague), a modern and delicate city that unfortunately still lacked a bit of nature in it. Luckily, I started my Master’s in Leiden, which marks the beginning of my amazing year with peacefulness, nature, and endless happiness. I literally just saw them whisper to each other again. What a lovely couple! According to my landlord, this dove couple had already made the balcony their sweet home before I moved here in August this year. At the end of August, this couple had two babies. They put so much tentative care on their eggs. One of the babies grew very well and is now already independent of his/her parents, but unfortunately, another baby died of malnutrition. I once saw the daddy dove staring at the body of his younger child in silence. That was a very sad picture. A month has passed and the doves seemed to have recovered from their loss; look at how sweet they are right now! My roommate and I joked that we will soon welcome new babies again 😉 Oh, and there are also many other lovely friends at my backyard! The very beautiful Leidse Hout is only 8 minutes away on foot from where I live. When the weather is nice, I often take a walk to the forest. And of course, as an “overage kid” I ought to visit my animal friends who live in the most beautiful spots of De Leidse Hout. I don’t know how many people have heard or been to Plantsoen, but this is the most breathtaking park I’ve ever been to. I have not only seen beautiful people and views at this park, but also marvelously pretty birds (most of them parrots). Just take a look at the following pictures, I am sure you will feel blessed to live in this wonderful world. 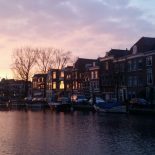 This entry was posted on November 6, 2015 by in Xueyan and tagged international student, international students, leiden, leiden university, nature, The Hague, the netherlands, Xueyan Xing.